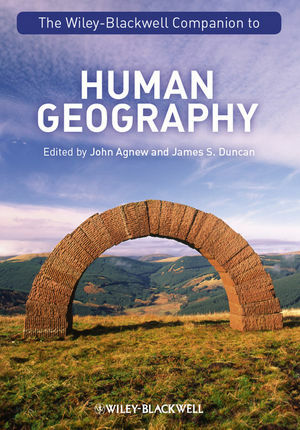 This volume provides an up-to-date, authoritative synthesis of the discipline of human geography. Unparalleled in scope, the companion offers an indispensable overview to the field, representing both historical and contemporary perspectives. John A. Agnew is Distinguished Professor of Geography at the University of California, Los Angeles. He has taught at a number of universities including Syracuse University, the University of Chicago, and the University of Siena. He has authored or co-authored numerous books including Berlusconi's Italy: Mapping Contemporary Italian Politics (2008) and Globalization and Sovereignty (2009). He was co-editor of the Blackwell Companion to Political Geography (2003). James S. Duncan is an Emeritus Fellow of Emmanuel College, Cambridge. He has written extensively on Culture Theory and landscape interpretation in contemporary America and nineteenth century Sri Lanka. Recent publications include Landscapes of Privilege: The Politics of the Aesthetic in an American Suburb (2004, with Nancy Duncan) and In the Shadows of the Tropics: Climate, Race and Biopower in Nineteenth Century Ceylon (2007). 1 Introduction (John A. Agnew and James S. Duncan). 2 Where Geography Came From (Peter Burke for David Lowenthal). 3 Cosmographers, Explorers, Cartographers, Chorographers: Defi ning, Inscribing and Practicing Early Modern Geography, c.1450–1850 (Robert J. Mayhew). 4 Colonizing, Settling and the Origins of Academic Geography (Daniel Clayton). 5 German Precursors and French Challengers (Vincent Berdoulay). 6 Creating Human Geography in the English-Speaking World (Ron Johnston). 7 Landscape Versus Region – Part I (Nicolas Howe). 8 Landscape Versus Region – Part II (Kent Mathewson). 9 From Region to Space – Part I (Trevor J. Barnes). 10 From Region to Space – Part II (Anssi Paasi). 11 Nature – Part I (Noel Castree). 12 Nature – Part II (Jamie Lorimer). 13 Landscape – Part I (Don Mitchell and Carrie Breitbach). 14 Landscape – Part II (Mitch Rose and John W. Wylie). 15 Place – Part I (Tim Cresswell). 16 Place – Part II (Steven Hoelscher). 17 Territory – Part I (Stuart Elden). 18 Territory – Part II (Jacques Lévy). 19 Globalization – Part I (Richard Florida). 20 Globalization – Part II (Emily Gilbert). 21 World Cities – Part I (Carolyn Cartier). 22 World Cities – Part II (Paul L. Knox). 23 Governance – Part I (Wendy Larner). 24 Governance – Part II (Stephen Legg). 25 Mobility – Part I (David Ley). 26 Mobility – Part II (George Revill). 27 Scale and Networks – Part I (Andrew E.G. Jonas). 28 Scales and Networks – Part II (John Paul Jones III, Sallie A. Marston, and Keith Woodward). 29 Class – Part I (Andrew Herod). 30 Class – Part II (Clive Barnett). 31 Race – Part I (Kay Anderson). 32 Race – Part II (Arun Saldanha). 33 Sexuality – Part I (Natalie Oswin). 34 Sexuality – Part II (Mary E. Thomas). 35 Gender – Part I (Michael Landzelius0. 36 Gender – Part II (Joanne P. Sharp). 37 Geopolitics – Part I (Phil Kelly). 38 Geopolitics – Part II (Merje Kuus). 39 Segregation – Part I (Larry S. Bourne and R. Alan Walks). 40 Segregation – Part II (Steve Herbert). 41 Development – Part I (Glyn Williams). 42 Development – Part II (Wendy Wolford).